You can't walk more than a few blocks in downtown Lima without stumbling upon another colonial church. Catholic religious congregations were each allotted a piece of land in the early days of the city, and most of them erected monasteries, convents or churches in honor of patron saints. The Church of San Francisco is one of the best preserved (you'll recognize it by the swarm of pigeons on the patio out front; vendors sell bags of seed to passersby to keep the birds coming). Built in the baroque-style of the late 1600s, San Francisco has several gilded side altars and an impressive lattice dome. The adjoining monastery has a superb collection of ancient religious texts, some of which were brought over by the first wave of Spanish priests after the conquest of the Incas. Most people go to San Francisco, however, for its catacombs. The catacombs were actually part of Lima's original cemeteries, which were built under churches. Tour guides say an estimated 75,000 bodies are buried under San Francisco alone, and many of the remains are exposed, stacked in strange patterns in circular stone pits. A catacomb tour is not for the squeamish or the claustrophobic. 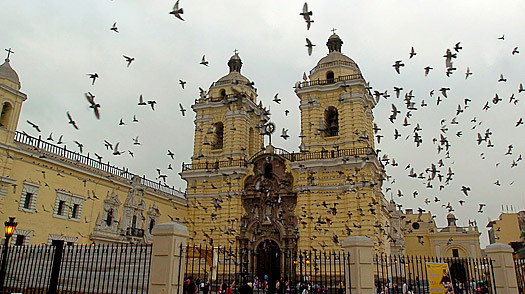 The Church of San Francisco is located about 45 minutes by taxi from San Isidro/Miraflores. It's open from 9:30 a.m. to 5:45 p.m. daily, with tours (including the catacombs) lasting approximately one hour; the entrance fee is about $2. Lima Guide: Find travel deals, hotels and more!